Sapporo (pop. 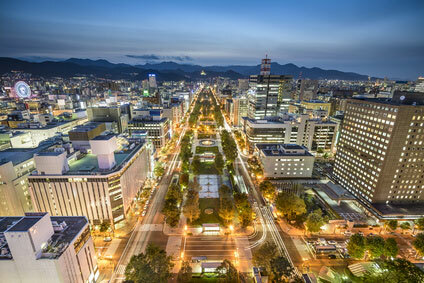 1.8 million) is the capital, administrative and economic centre of Hokkaidō. 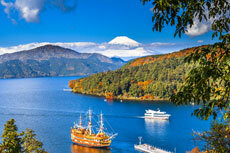 It is the largest city north of Tokyo, and about a third of all Hokkaidō residents live there. 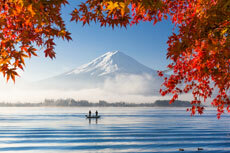 Sapporo became a household name in 1972 when it held the Winter Olympic Games. 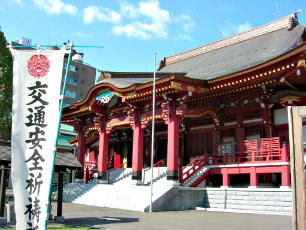 Hokkaidō was mostly Ainu land until the Meiji era, and Sapporo didn't become a city until the late 19th century. 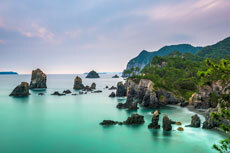 The city's name comes from the Ainu language for "large river flowing through the plain", referring to the Toyohira River that crosses the city on its Eastern side. 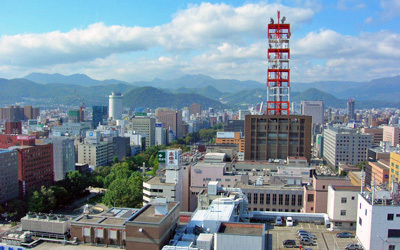 Sapporo has the particularity that addresses are described as cardinal point from the official city center (near the TV Tower). 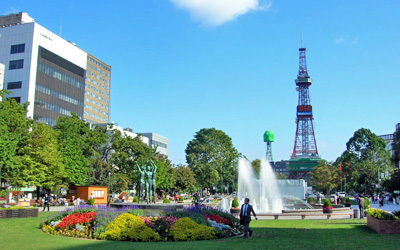 Odori-koen Park (大通り公園) divides the city in "North" and "South", while the Sōsei-kawa Canal (創成川) divides it in East and West. The major avenues further divide each block by number (North 1, North 2, North 3, etc.). Each block can be found by its geographic location on the grid (eg. North 3, West 5), making Sapporo one of Japan's easiest city to navigate. 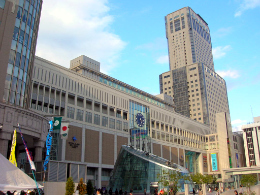 The main shopping street is along the metro's Namboku line, where big department stores like Mitsukoshi, Parco and Robinson's can be found. 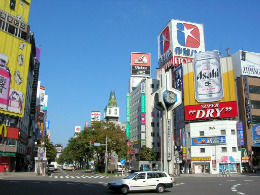 Susukino is Sapporo's equivalent of Tōkyō's Roppongi or Kabukichō, and is the largest entertainment district north of Tōkyō. It is located around Robinson's and abounds with restaurants, karaoke, pachinko parlours, nightclubs, soaplands or adult shops. The city is renowned for its parks and surrounding nature. 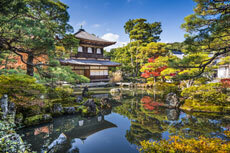 The Ōdōri-kōen Park, bisecting the city in two, is one of the best places for a stroll. The Botanical Garden (Entry ￥400; closed on Monday) of Hokkaidō University was Japan's first modern botanical garden when it opened in 1886. It makes for a pleasant stroll in the midst of some 4000 species of vegetation unique to Hokkaidō. It also houses a small Ainu Museum. About 1 km west of the Botanical Garden is the Migishi Kotaro Museum of Art. The museum itself is not remarkable, but you can relax in its delightful little park (free entry). Nakajima-koen Park, in the south-western quarter of the city centre, is a popular recreation spot, with a lake attracting water birds. 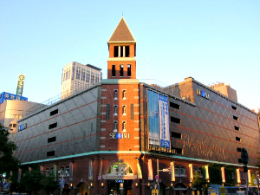 It is a venue for sports, concerts and arts, and is home to the Kitara (Sapporo Concert Hall) and Hokkaidō Museum of Literature (only interesting if you read Japanese). 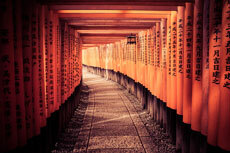 Sapporo may not have many impressive or historically significant sights, but it does have a handful of famous landmarks. The most photographed place in town is undoubtly the Sapporo Clocktower (時計台, Tokeidai). 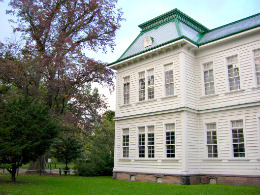 It was errected in 1878 as the drill hall for Sapporo Agricultural College. 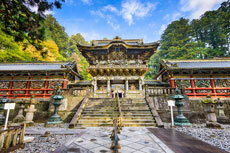 It is neither big, nor gorgeous, but its Western architecture makes is queer enough for the Japanese to find it special. Another tower, much taller this time, is the Sapporo TV Tower, marking approximatetively the official city center, at the junction of Odori Park and Sousei Canal. It was built in 1957 and soars to 147m. The 360-degree panoramic platform only stands at 90m above the ground - enough to contemplate Mount Teine and Ishikari Bay, though. If you don't want to pay the ￥700 admission fee, there is a similar panorama on the roof (19th floor) of the shiyakusho (town hall), just bewteen Odori Park and the Clock Tower, where entry is free. 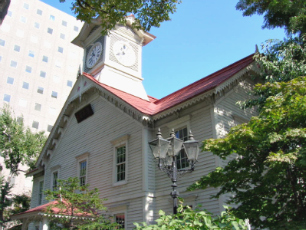 The most attractive historical building is probably the redbrick Former Hokkaidō Government Building. It was originally constructed in 1873, but caught fire and was rebuilt in 1888. Its octogonal dome is said to have been modelled on the capitols of Maryland and Massachusetts. Another redbrick construction, the Sapporo Beer Garden & Museum used to be the site of the first Sapporo Brewery, Japan's oldest beer brewery, established in 1876. The "Sapporo Beer" is one of Japan's most popular brand, also famous for its Yebisu beer (which is not made in Tokyo's Ebisu district, although Sapporo Beer does have an office there). 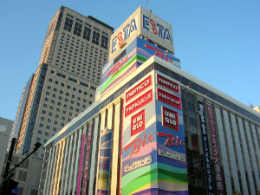 This building is a bit outside the center, 10 walk from Higashi-Kuyakusho-Mae Station on the Toho-line of the Metro. 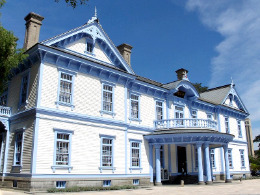 South of Susukino, on the northern edge of the Nakajima-kōen Park, stands the clapboard Hōheikan, a prestigious Western-style hotel built in 1880. Emperors Meiji, Taishō and Sōhwa all stayed here on official visits to Sapporo. Originally located in the Nishi 1-chome neighbourhood, the hotel was moved to its present location in 1958. It was designated an Important Cultural Asset in 1964. One of Japan most famous and unique festivals, the Yuki Matsuri, or "Snow Festival", is almost emblematic of Sapporo and Hokkaidō's cold climate. Although some people find it too mediatized, its famous buildings (Taj Mahal, Bank of England, etc. ), imaginary castles and other sculptures, entirely made of ice, bring approximately two millions visitors each year. 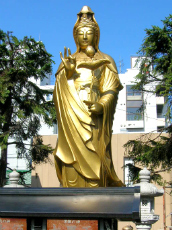 Some of the sculptures are made by the Japanese Self Defence Forces. 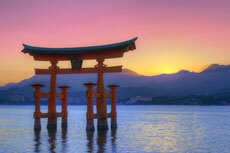 The festival has been held every February since 1950. Book accommodation long in advance. Most visitors reach Hokkaidō by air. There are 3 domestic airports at proximity of Sapporo : Chitose (35min by train, ￥1040), Okadama (25min by train) and Asahikawa (2h by train). Chitose is the main airport. Okadama Airport has flights inside Hokkaidō from/to Hakodate, Kushiro, Wakkanai, Memanbestu, Nemuro-Nakashibetsu. Chitose Airport has flights from/to Rishiri, Wakkanai, Memanbestu, Kushiro, Nemuro-Nakashibetsu, Aomori, Akita, Misawa, Hanamaki, Sendai, Yamagata, Shonai, Fukushima, Niigata, Tokyo (Narita and Haneda), Toyama, Komatsu, Nagoya, Osaka (Itami & Kansai airports), Takamatsu, Okayama, Hiroshima, Matsuyama, Fukuoka, Kagoshima and Okinawa. Asahikawa Airport has flights from/to Hakodate, Kushiro, Tokyo and Nagoya. Rapid trains to Otaru take about 30min (￥620), while the fastest limited express make the journey to Hakodate in 3h15min (￥8,590). If you are not in a hurry, Hokuto runs buses between Sapporo and Hakodate (5h15min) for just ￥4,680, further discounted to ￥3,865 if 4 tickets are purchased at the same time.